Logitech is a renowned name in computer consumables and its latest addition the Logitech K750 solar powered keyboard is a must have for every gadget enthusiast. The K750 suits Windows based operating systems while its counterpart the K760 is designed for Macs, iPad and iPhones. Both the keyboards are solar powered and can also charge from a normal light in the room or even from the monitor lamination. The device is super sleek with a thickness of just 1/3 inches and comes with a long range wireless connection of 2.4gHz. The PVC free construction is also made from fully recyclable materials and the design process leaves a minimal carbon footprint. One full charge allows you to use the keyboard for up to 3 months in total darkness . You can place it in the sun for optimum charge, else the indoor light including the monitor would be sufficient to charge it. Smooth, comfortable and fluid keystrokes make you effortlessly use the keyboard. The built-in Unifying receiver also allows you to add a compatible mouse, keyboard etc- by using the same tiny received plugged-in to the USB port. It’s quite a good choice if you are looking for a wireless keyboard as it eliminates the need for a battery charger and is powered by light. 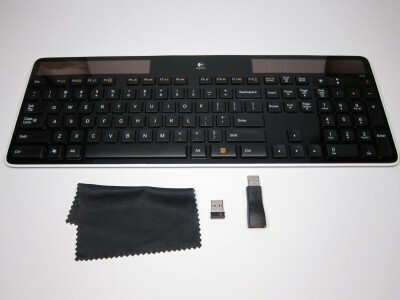 The package comes with the keyboard, unifying receiver a, wireless extender and a handy cleaning cloth. You can buy it from leading retailers and can also purchase it from their website or from Amazon at the below link.